After testing them in 3 different shows I must say I love these sticks. The look is stunning, with the beam of light filling the whole stick, the effect is much better than with other sticks. The material used is very transparent but still has a good grip. The weight and behavior of the sticks is very similar to a regular stick. The combination of diameter and weight gives a nice gentle fly which I would compare to the DEOS one. The durability is great, Henry's sticks are the toughest ones, but I feel these ones are at similar level. These sticks I have come in two weight versions and two color options. - Playability: The light version feels completely like a normal stick, the Standard feels a bit more bulky but I think it is possible to do all your tricks after 15 minutes of playing. Most of them after 3 minutes. - Durability: The Standard version is more durable than the light one. 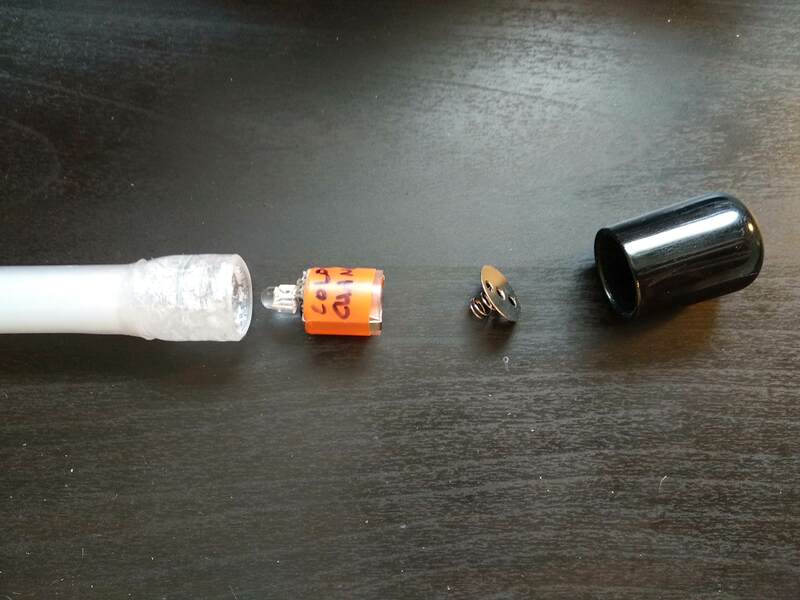 I managed to break a Light one in a test session. But it is because the sticks felt awesome, I started to make my hardest release the stick tricks, and in the end I failed in a double minigenocie... the kind of hit that would bend aluminium (like xtreme sticks from Babache). For the rest I have played like with normal sticks, and I have had zero problems. Love them. 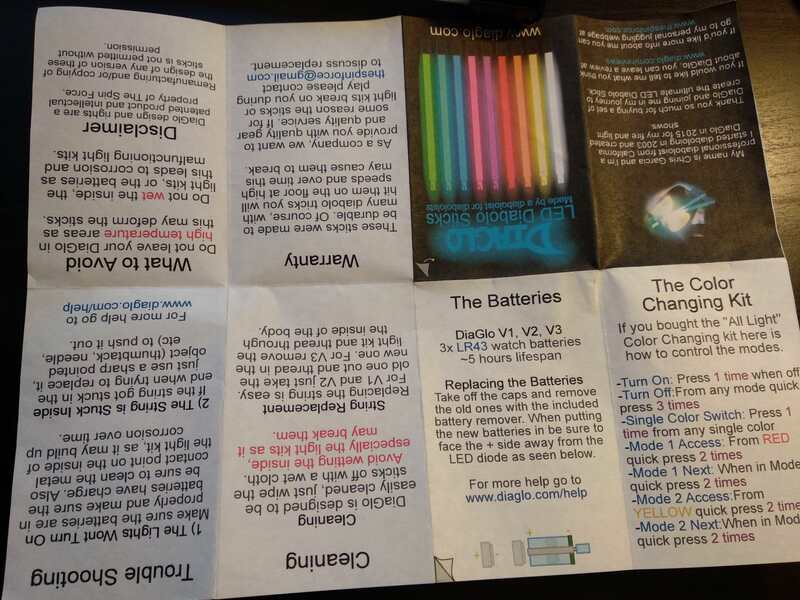 - LED module: in the v2 you cannot exchange the Fixed color for the Changing color module. Once you buy your set, the module is fixed. 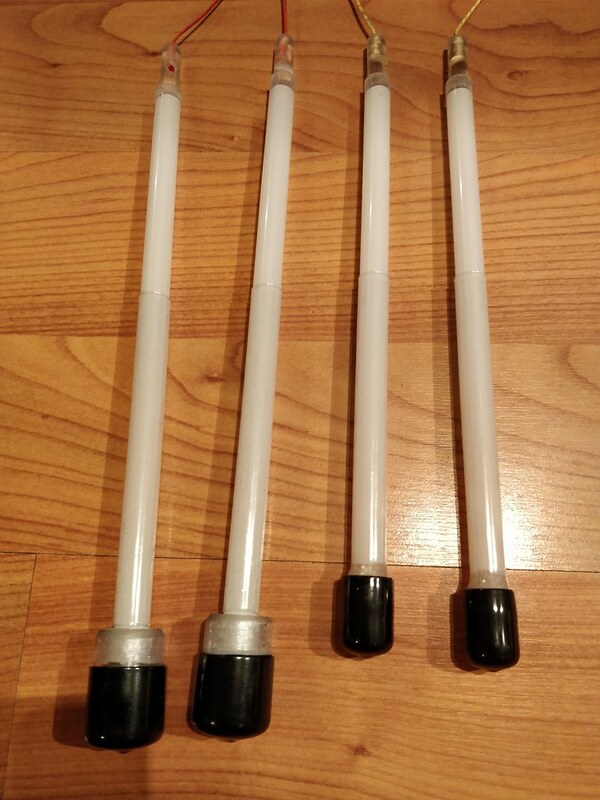 - Activation: in the Fixed color ones you need to turn a plastic piece in the bottom so you need to remove the plastic cover that protects the bottom of the stick (10 seconds both sticks). In the Changing color ones you need to press a button, with the plastic protection is not working 100% of the times, but I think it is great and activates instantly. 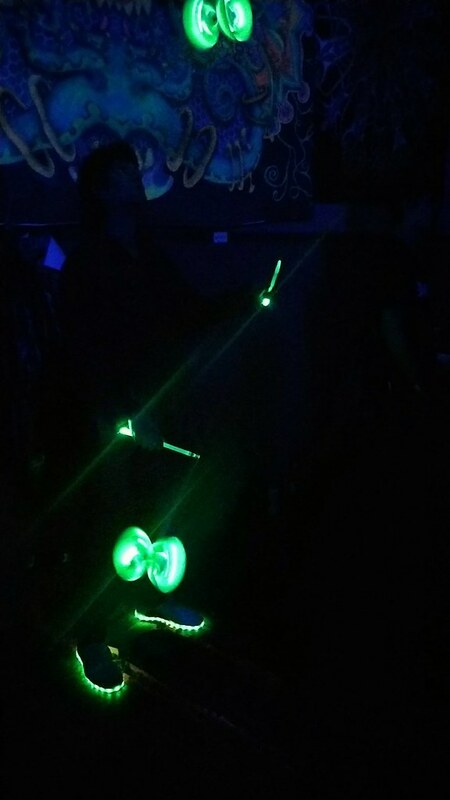 tl;dr: For me these are the best LED diabolo sticks out there. 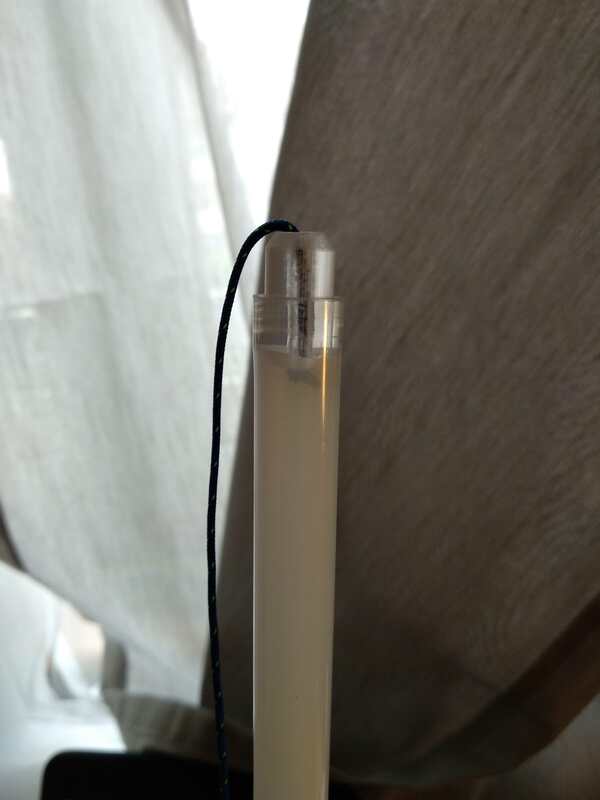 If you want to have a solid, very good looking pair of light sticks, buy a fixed color standard and you will know you have a great piece of equiment ready for whenever you may need it. I bought these lights things for collection but now I perform with them Motivation! See the original post from The Spin Force. Finally we have the version 3 of the Diaglo sticks! Wis and me were testing both versions (fixed colour and change colour) and I will add few things to the Latest news that Wis wrote in the original post. (@Wis feel free to edit and put everything together if you wish ). - Same weight as the Light (v2) and length around 30cm. - More durable than the v2, the place where the LED module is placed looks more durable and better designed. - You can exchange LED modules, you can change from Fixed to Changing colour modules or even replace the LED if it get lost or broken (or maybe improved in a new version ?? ). - The extraction of the batteries is easier compared to the v2, included a magnets based tool that helps to extract the batteries (see picture and video). 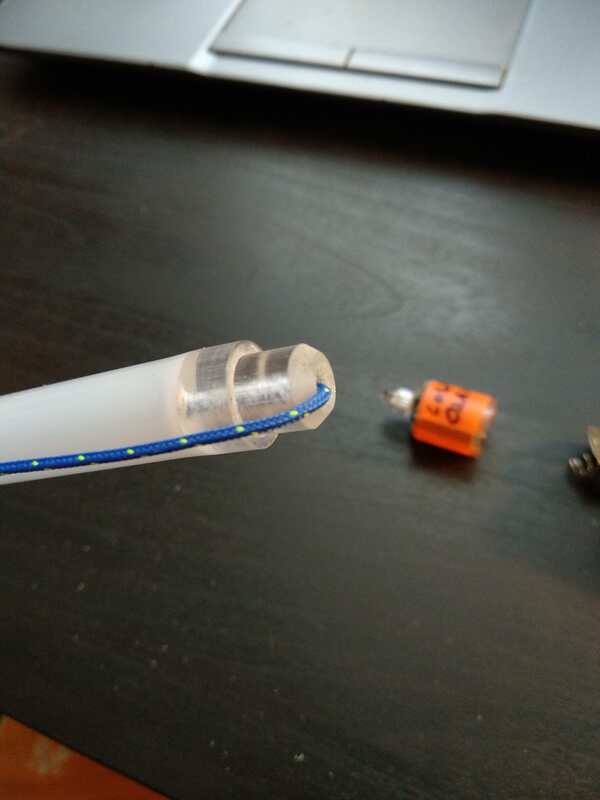 - The string goes through the stick, it does not go out from a side like in the v1 and v2, see the picture below, you need to remove the LEDs module in oder to change the string. -Pair DiaGlo sticks = string + 2x sticks + 2x removable LED with the switches + 2x black cap cover. There is no differences in the shape, weight or length of the sticks only the LED module is different. Fixed colour LED module: The way to setup and turn on the lights is a bit harder in this module but more durable and reliable, in order to turn it on and turn it off you will have to disassemble or assemble everything, there is no need to press the button, it takes just a minute but as it has few small parts you will have to be very careful every time you use them in order to do not lose any of the small pieces. The brightness is more powerful in the fix colour than in the Changing colour (check original post) but anyway the changing colour version is also really powerful and bright enough. 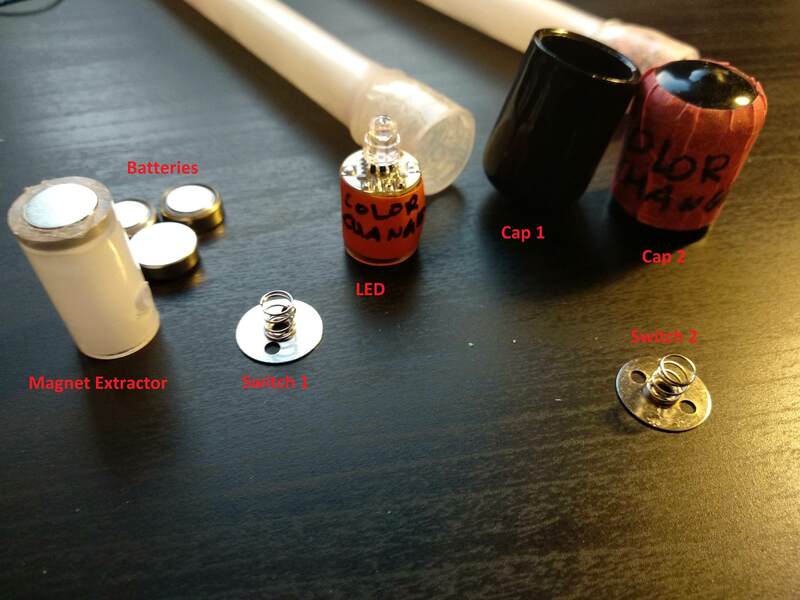 Changing colour LED module: the setup is easier and you will not have to disassemble everything in order to switch off the sticks, anyway it is also recommended to extract the batteries after use the sticks because the LEDs will drain the batteries even when switched off. 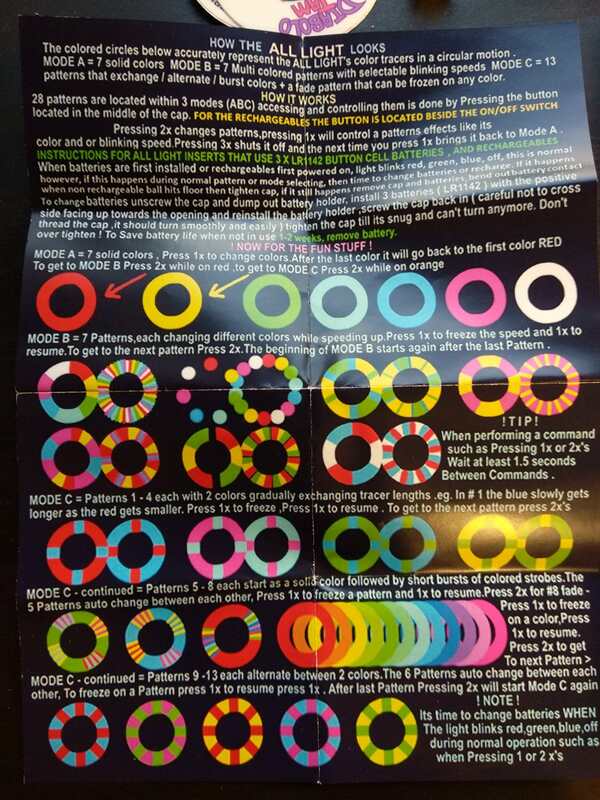 LED module Changing Colour version: in this video I tried to show how to navigate between all the possible for this Changing Colour LED module, it took me a while to read the instructions (picture) and fully understand it but once you have it is not so complicated . For live performances and shows I would recommend to choose the colours before go to the stage, not during the show. We were really impressed with the version2 and this version is even better. 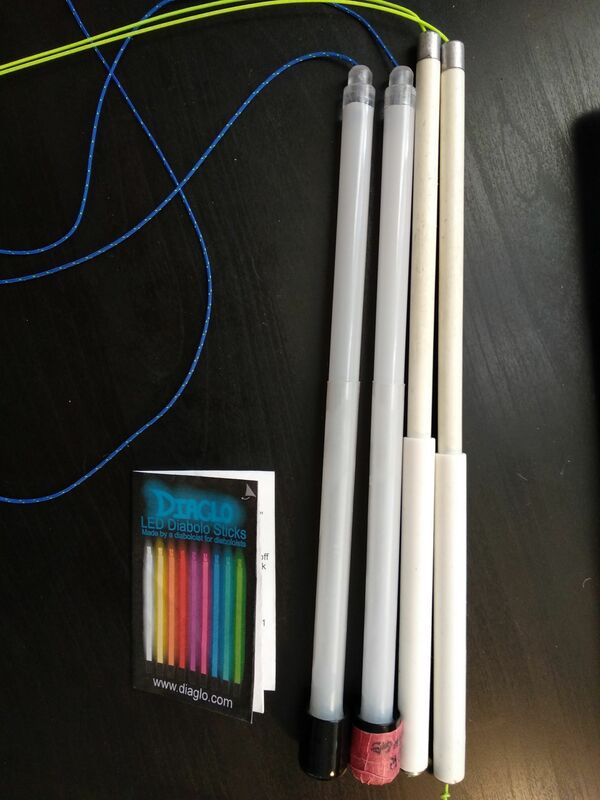 As Wis already mentioned this are probably the best diabolo LED sticks that you can get. The sticks are built in just one piece which is making them really strong and durable, apart of the LED module and the black plastic caps the rest is just one piece; really transparent plastic which thanks to a powerful LED is really well and fully illuminated when the lights are on; strong and flexible plastic which I think should help with the durability (a bit more flexible than DEOS). The LED modules are placed the bottom of the sticks, we know that it’s usually that’s the part which suffer the most with suicides/genocides but it is quite well protected with the black plastic caps. 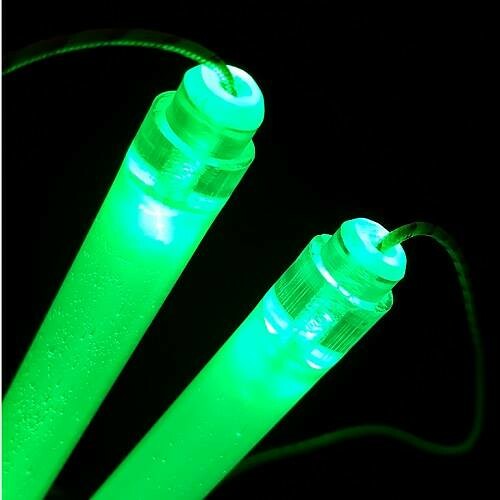 When you play with them you almost cannot feel the difference between this LED sticks and any other advance diabolo regular sticks with no LEDs, strong, really bright and perfectly balanced even when you are playing with the batteries. 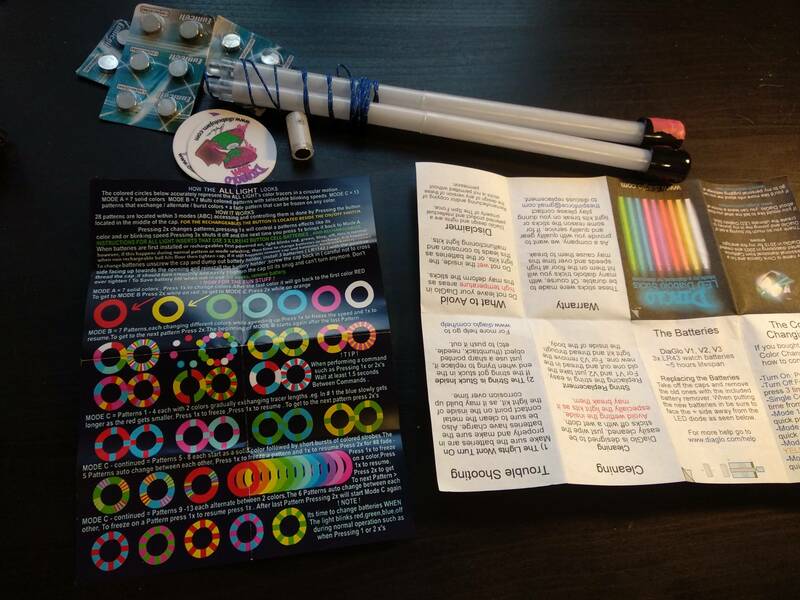 I have tried many other diabolo LED sticks and either they were broken after few hits or they had too heavy LEDs modules hence not well balanced, Chris managed to create a light, strong and bright LED diabolo sticks. As negative points: I already mentioned the setup of batteries, especially in the fixed module is not the easiest, you need to disassemble everything and this could be problem especially in dark places… also you have to be careful to don’t lose anything. In the changing colour module to navigate through the colours is not fast and easy, it has just one ¨button¨, I guess this helped to be lighter but I will always setup the colour that I will use before go to the stage. After train with the changing colour I have few times after hit the floor that the light changed to a different colour or restarted the mode but we have to remember that this are sticks for stage and shows, not for training, we should be more careful and minimize the risk. The price can be high for some people but for me it’s fair, thinking that Chris target users are professional diabolo players. 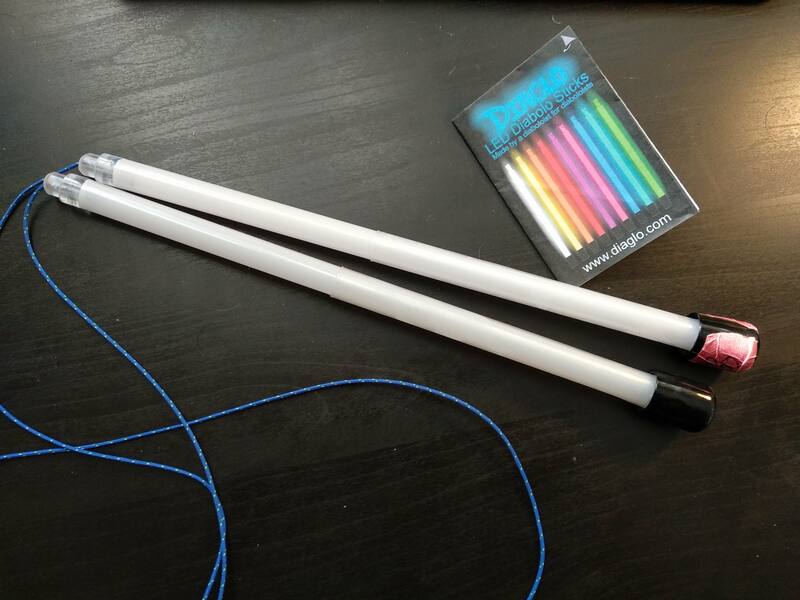 tl;dr: (the review from Wis still valid ) For me these are the best LED diabolo sticks out there. 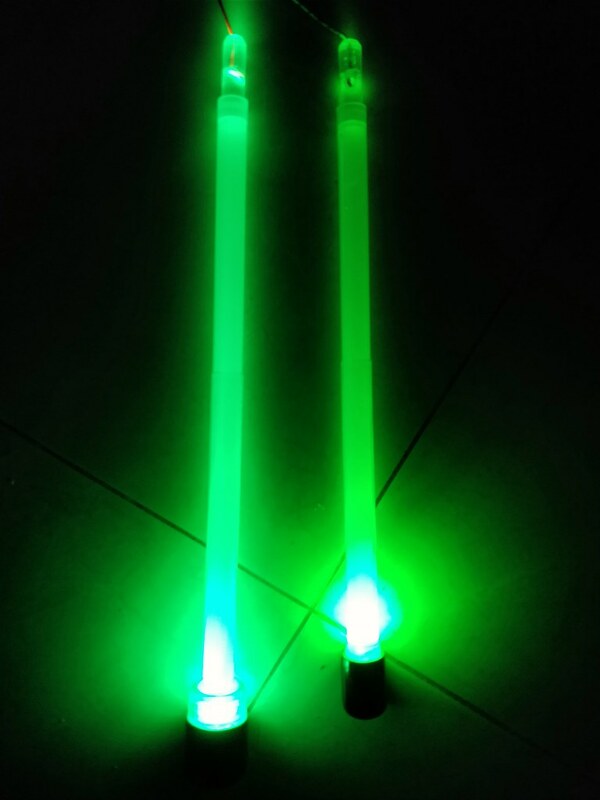 If you want to have a solid, very good looking pair of light sticks, buy them and you will know you have a great piece of equipment ready for whenever you may need it. Feel free to ask if you have more questions or if something is not clear. You can also contact Chris. See the original post from The Spin Force.